1 What is Online Reputation Management? The internet and the social media continue to have increasing influence our professional and personal lives. In recent years, customers have taken to social media and search engines to find out more and communicate with businesses, across industries. In such a scenario, great engagement and viral promotion can turn your fledgling business venture into an online sensation in a few weeks’ time. However, the internet is a double-edged sword. All it takes is one misguided blog post or a delayed social media response to disintegrate your brand reputation. Your online reputation can either help or hurt your business in the long run. One might think how bad can this be? After all, it’s just a wrong tweet or an honest mistake. 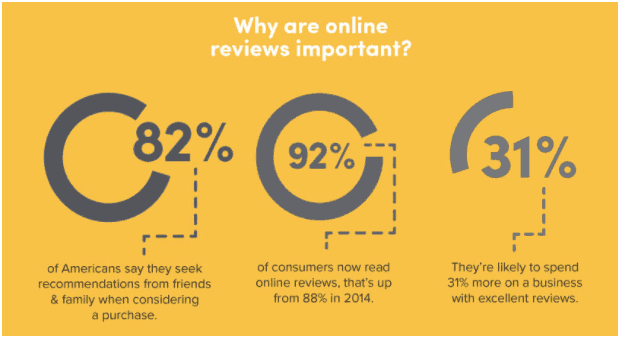 However, nearly 92% people read online reviews when looking for a local business. Nearly 42% won’t deal with a business with less than a three-star rating while 68% form an opinion about your local business after reading just 1-6 online reviews also 54% shared bad experiences with more than five people. That’s what makes online reputation management (ORM) so crucial. In these places, you will often find unfriendly reviews or criticisms. Your job is to monitor what people are saying about your brand and prevent any conversations that can damage your brand image. Don’t think about your reputation only when it is compromised. Instead, try to maintain a positive online presence right from the beginning. One of the first steps involved in ORM is to find out what your online reputation already is. As mentioned earlier, the best way to find out what people are saying about your brand is to google it. However, while doing so just make sure you are using the right brand name or keyword – the same ones people will use to look for your business. Search for variations of your brand name as well as misspellings. Make sure you don’t miss anything. 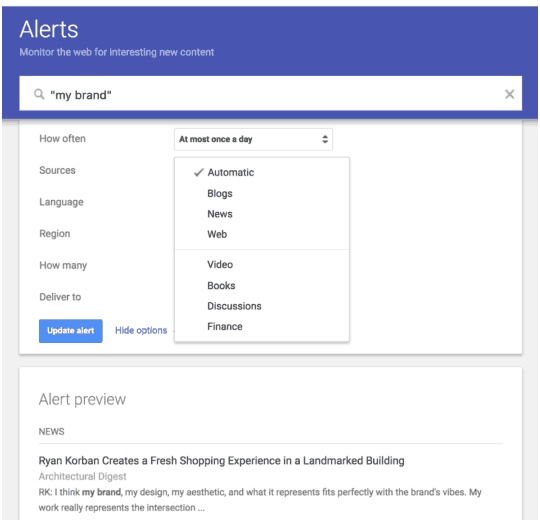 You can configure Google Alerts to know when someone mentions your brand in an article. 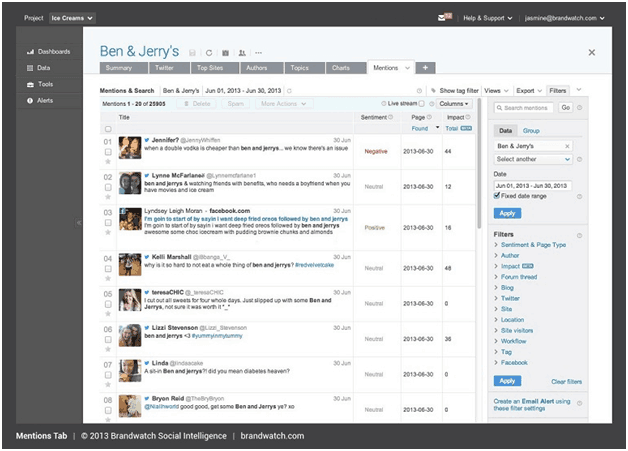 Another great option more geared towards social media is to use a social listening and tool like Brandwatch, which lets you monitor conversations taking place on social networks about your brand, product, or any keyword related to your industry. You can also keep an eye on what competitors are doing. The best part is you can see social media mentions related to your brand even when your brand name is not tagged directly. These tools are super easy to use and need only your eyes and ears while they do most of the legwork. However, you will still need to find the relevant keywords and terms being used in your niche, to help you add to the latest conversations. Once you have a monitoring system in place, you’ll find your reputation falls into any one of the following three categories. Negative: This category paints a grim picture of your brand. It is the lowest your online reputation can sink. Whether people are throwing false accusations around or not, your brand reputation gets tarnished just the same. Uncertain: Sometimes, a Google search of your brand leads to totally outdated or irrelevant information. Though this is not as bad as having a negative rep, it certainly stops your potential customers from connecting with your brand. Positive: If your overall reputation is positive, you can breathe a sigh of relief. Everyone seems to be saying good things about your brand on the whole. Unfortunately, very few brands enjoy this luxury at all times. Once you know where you stand, the next obvious step is to improve your reputation. Depending on the three categories we discussed, you can figure out how big your task is and plan accordingly. But, first you need to find out why some people are talking negatively about your brand. This applies to all three categories of reputation. There are several reasons why their perception of your brand may be less than optimal. Simply Bad Ideas: Sometimes, it is just a bad idea to use a controversial analogy or illustration to promote your brand. 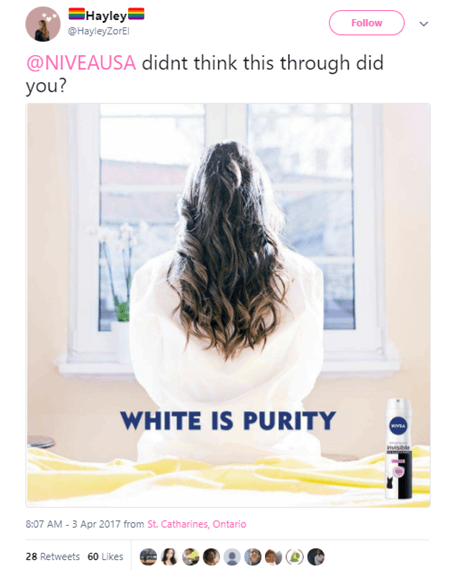 That’s what happened when Nivea decided to use the “White is Purity” slogan to promote a new deodorant ad campaign. Given the connection – however faint – to racial prejudice, the brand came under intense social media fire. 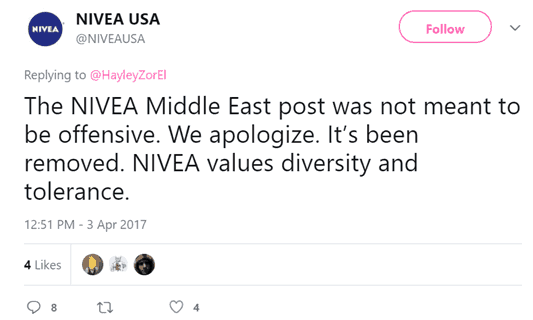 The increasingly loud revolt forced Nivea to apologize and take down the advertisement just hours after it was published. Misreading a Situation: Many brands have also been bashed up online for taking the wrong side, wrongly construing a political situation, or misjudging a market trend, resulting in severe social media backfire. When the New York taxi drivers’ union Taxi Workers Alliance decided to hold a temporary strike on trips to and from JFK airport to protest president Trump’s travel ban decision, Uber tactlessly decided to cash in. Unfortunately for them, they misread the situation leading to the aggressive reaction from their users. Your brand may face similar public ire where there’s a delayed, misinformed or rude response from your side to a genuine situation. Use the brand-customer relationships you’ve built and whatever insights you’ve gathered from your engagement so far to deal with any problems that arise or any potential PR crises that are developing. Chances are, you already know how to engage with your regular audience. However, you need to be a little more careful here. Transparency is the key: Don’t hide from criticism, address it openly. Make sure all your employees also talk about your products, services and the situation transparently. Remember, hiding will only make the situation worse. So, be honest. Swift and polite responses can save the day: If there has been a mistake at your end or your post is attracting too much heat, apologize immediately just like Nivea did and remove the post. Make sure to provide a genuine and professional response. In most cases, a swift response from your end can help mellow the situation. If it’s a minor issue, try to provide the solution immediately and publicly. 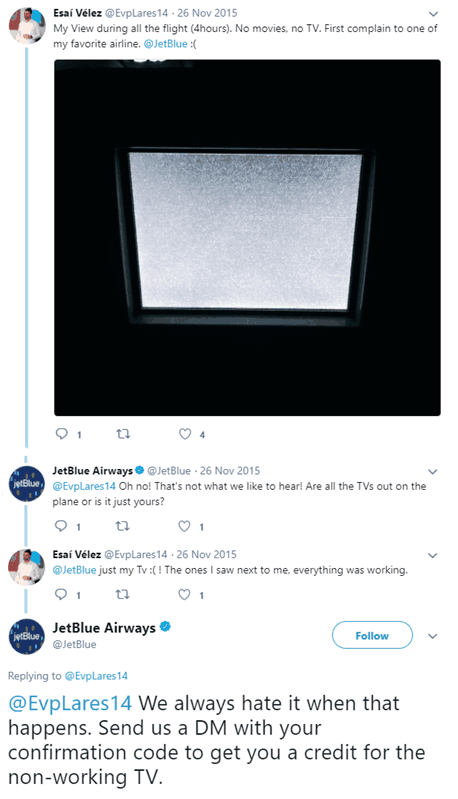 JetBlue is well-known for responding to their customers promptly via their twitter handle, usually within minutes. Crush Illegitimate Attackers: No matter how many precautions you take, your business will sometimes be a victim of deliberate online abuse. You should respond firmly (but not with abuse) to these illicit attempts to tarnish your reputation. You can politely ask the person who has posted the malicious content to take it down. If politeness doesn’t work, take the appropriate steps outlined by the platform where the attack is happening. 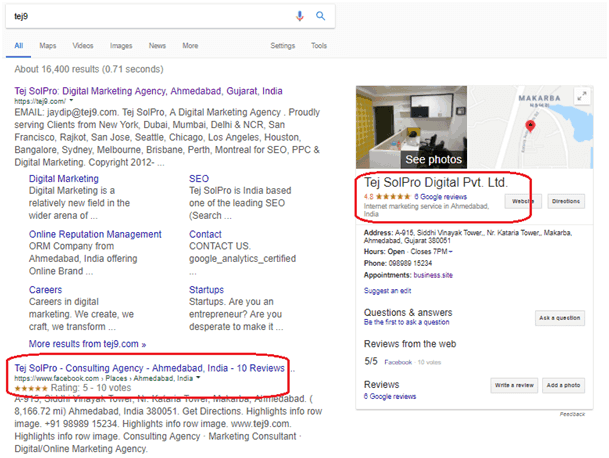 You can submit a legal complaint to Google asking them to remove content such as malicious reviews from the search results. You can also request social networks to take down fake or real accounts associated with such abuse. If that doesn’t work either, don’t hesitate to consider legal action. You might have to sue the perpetrators to discourage such attempts in the future. If you haven’t already, start reinforcing your online visibility with the right marketing and PR tactics now. Create a long-term social media strategy to get your voice across different platforms and actively engage with your potential customers. If you already have a strategy, try to upgrade it as soon as possible. To update or create a new strategy, you must constantly attempt to understand and monitor what people are saying about your business, as discussed earlier. One of the most crucial factors that will help improve your reputation is to learn from your mistakes. Whenever you start planning for a new campaign or an advertisement roll out, ask yourself the following questions. What went wrong when your reputation took a plunge last time? Did someone (a former employee or a customer with a vendetta) make outrageous claims against you with misleading information? Does your customer service get to online complaints on time? Did your marketing team fail to anticipate the possible outcome of your campaign? Was any of your social media accounts hacked? Make sure to study your customers, their pain points, and sensitive socioeconomic issues surrounding them before launching any campaign. If possible, try to avoid tying up your marketing strategy with controversial or sensitive issues. Your brand’s online reputation can make or break your business in just a matter of minutes. Unfortunately, when your standing takes a dive, sales will soon follow. Dealing with even a few negative remarks can be an overwhelming task, but you have to keep doing it in order to improve and maintain a positive brand reputation in the long run. Just remember to take one step at a time, and work closely with customers whom you can turn into advocates. Did you ever have to deal with a social media disaster? Do you have a brand with an unshakeable reputation? Share your experience with us in the comments! It is really an informative article. I loved reading it specially the point no. 1 Thank you so much for sharing. Keep the good work up. Great article... Digital marketing is very important for making reputation for any business. Social media is play very important role for promoting business and making brand reputation. From this article you give us good tips for digital marketing strategies. Thank you for sharing this nice article.